Despite its name and pedigree, Fight Night Champion doesn't win the title. Most fighting games start out the same way — I push a button and throw a punch. Then my opponent avoids the punch by creating a magic green force-field with his psychic powers, kicks me across the room with one foot while launching a barrage of throwing stars in my direction with his other foot. Then I scrape myself off the floor, stand up and start attacking every button on the videogame controller as fast as I possibly can. This usually continues until someone wins. Somehow. But not so with the boxing simulation Fight Night franchise, which is the most intelligent, subtle game ever to feature burly men pounding gobs of blood and bone out of each other’s faces. Instead of mashing buttons, I need to sit back and observe. As my opponent bobs and weaves his way around the ring, I am watching for an unguarded piece of flesh to pound. And as I seek a crack in his defense, I’m busy defending myself, trying to judge the way he shifts his weight or leads with his head. When we do throw punches, they aren’t the supernatural lightshows that substitute for melee combat in most fighting games. Punches in Fight Night can be fast and precise, or slow and heavy depending on how fatigued I am. Each swing throws my body out of balance, and every action requires time and physical resources. In my living room, I can mash the buttons all I want, but in the ring I can only throw one punch at a time. Unfortunately, Fight Night Champion messes with the superb controls that its predecessor, Fight Night Round 4, brought into the ring. That game required players to throw all of their punches with the right thumbstick — a brilliant decision that annoyed so many gamers that the publisher caved in and modified the game so that players could throw punches by pressing buttons, too. But I can still use the thumbstick, and when I do, Champion achieves a sort of physical analogue that even the best motion sensitive games can’t achieve. The real problems in Champion come simply from sloppy programming. I shouldn’t be able to send consecutive left jabs to my opponent’s head without him either blocking my attacks or falling down onto the mat. But during one particularly absurd match, that’s exactly what happened. And before I knew it, I was button mashing, unable to see the invisible force-field that he had somehow thrown up around his head. THE GOOD: Fight Night has always had spectacular character models and animation — rippling flesh, flying clots of blood, heaving chests, rivulets of sweat, and grown men trying to stand upright and failing spectacularly. THE BAD: Fight Night Champion takes its name from “Champion Mode,” a short storyline that tells of the rise and fall and rerise of a young boxer. This means that I get to sit back and watch an unimposing villain wander around saying things like, “You have no idea who you’re f---ing with!” That sort of thing might work in James Bond, but it makes Champion into more of a watching game than a playing game. 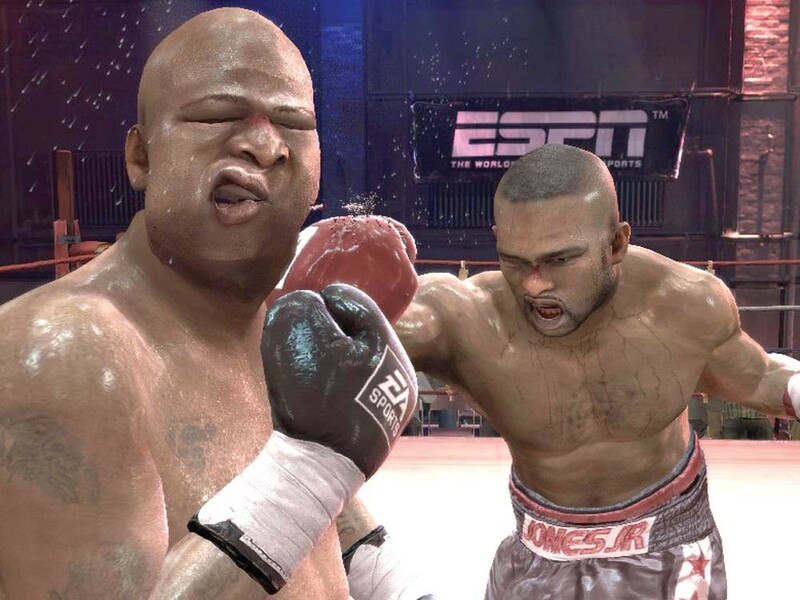 THE BOTTOM LINE: Despite its name and pedigree, Fight Night Champion doesn’t win the title.